I'm writing this from a place of relief. But, had I written it five minutes ago, it would be coming from a place of sadness (located in the middle of my bed, under the covers, with some treats brought back from Japan in my mouth). See, five hours and five minutes ago, my Instagram account was gone. Absolutely gone. Deleted. Unable to be accessed. All my photos, likes, and followers ... vanished. With no warning or explanation. This, of course, included photos like this one of all our wedding items packed into our guest bedroom and this one with them all packed into the car. All my photos -- and all my access to the tagged with our wedding hashtag -- were gone. I'm gonna be honest: It was awful. I was so lucky to have gotten my account restored, but the couple dozen Google searches I did when trying to remedy this gave me little hope. When most accounts are gone, they're gone forever. I was texting my friend Beth and she said I should use this as a cautionary tale. I absolutely agreed. Because how many of you have photos -- especially wedding photos -- up on Instagram, thinking that they will be there forever. They might not be, as I've witnessed. 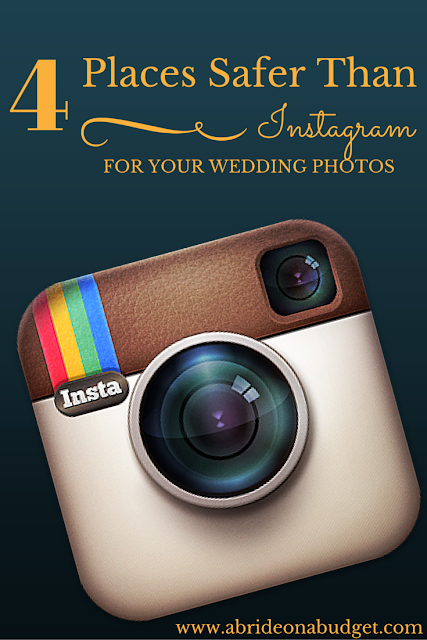 So, here's a list of four places safer than Instagram for your wedding photos. 1. On A Flash Drive. All our professional wedding photos are on a flash drive. I feel really safe with them on there. Flash drives can wear out, actually. They only can take a certain number of uses before they stop working. Every time you write or rewrite to a flash drive it uses some of its memory. Eventually it will run out of memory, can become corrupted, and that's that. So what I actually did was back up my entire flash drive onto my laptop and I don't ever access the flash drive, really limiting the amount of times it has been accessed. But, for goodness sake, if you really do want to use the flash drive every time you need to see your wedding photos, don't just pull it out when you're done. You have to remember to eject it. 2. In A Photo Book. I love tangible products because they can't just disappear like my Instagram photos, so I'm a big fan of photo books. There are a lot of sites where you can make digital photo books -- Montage, Shutterfly, or your favorite site. You can upload your photos, choose your layout, and add pages if you need. If you're old school, you could always print your photos and put them in an actual photo album. Our photographers actually made us a book of our proofs, using thumbnails of each of our 1,300 photos so we at least have a tangible copy of each. 3. In A Google Drive Hangout. When we got back from Japan, Pete created a Hangout on Google Drive. He uploaded over 300 photos from our trip to it. Then, he sent the link to everyone from our trip (we went with about 20 other people). Everyone is able to upload their photos so we are all able to share. This is great for your wedding. You can create your hangout before the wedding and add the link to your wedding website. Your guests can add photos of when they're traveling to your wedding, at your wedding, and more. And that means no need for a wedding hashtag. Minutes after my Instagram account was restored, Beth told me I needed to back my photos up somewhere. "As soon as I figure out how to save them, I will," I told her. See, with Instagram, you can't hold down on the photos and save them like you can in a text message. Beth was awesome and logged into the Snapfish app on her phone and found out that you can save your Instagram photos to your Snapfish account. If you're like me and don't have any room on your phone, you can actually upload via the website too, which is easy. Plus, new Snapfish members get 100 free photos (if you sign up here), in case you wanted to print some too. The moral of the story? Your wedding photos aren't safe on social media, no matter how safe they seem. So definitely back your wedding photos up somewhere. They'd be awful to lose. BRIDAL BABBLE: What place do you feel is safer than Instagram for your wedding photos? Great tips! My daughter just recently got married and I will be passing this on to her. Thank you so much for sharing your wonderful ideas with us at Brag About It!